Blendon Park Condominiums feature highly desirable condos in the North Columbus area. Just South of Westerville, Ohio and about twenty minutes North from Downtown Columbus, these Columbus condos are sure to impress you. They are set back in a private, wooded and serene atmosphere. 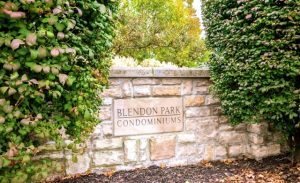 The Blendon Park Condominiums are the perfect place to call home and enjoy maintenance free living. The HOA fee covers landscaping, snow removal, trash, sewer, exterior building maintenance and reserve fund. Additional amenities provided by The Blendon Park condominiums include a clubhouse and community pool. Blendon Park condos are resale condos and many have had fantastic upgrades. These two-story condominiums provide plenty of living space with bright and airy open floor plans. You truly could not get a better condo deal such as Blendon Park with their great Columbus location and features. Durable laminate flooring throughout in many helps keep your Columbus condo clean. Separate dining areas by sliding glass doors allows you to enjoy meals while gazing out at your private balcony and green space. Decks provide an ideal space to set up the grill and patio furniture. Enjoy, cookouts with friends and family. In addition, ceiling fans and central air help keep your Columbus condo cool during the warm Columbus months. Blendon Park condos are an ideal choice for those not looking to spend a fortune but still reap the benefits of condo living. The area has shopping, major highway access and plenty of sites to see. Blendon Woods Metro Park is just minutes away. In conclusion, Blendon Park condominiums should definitely be on your condo list. Our Columbus condo specialists have the answers to your questions! Contact My Columbus Condo for more information or showing today.